The STIHL RT 6112 ZL offers you top cutting quality and a sporty design. This ride-on mower effortlessly negotiates difficult terrain and harsh working conditions. Thanks to its comprehensive equipment and powerful 2-cylinder 23HP engine, even protracted mowing on extensive areas becomes a pleasant and relaxed activity. While the large cutting width of the lawn tractor enables fast mowing, the synchronous mowing deck, the cutting height adjustment and catching management system simultaneously ensure high-quality and particularly uniform cutting results. Smooth navigation is possible immediately at all times thanks to the single-pedal self-propulsion. For even greater driving comfort, the cruise control can be conveniently activated at the press of a button. 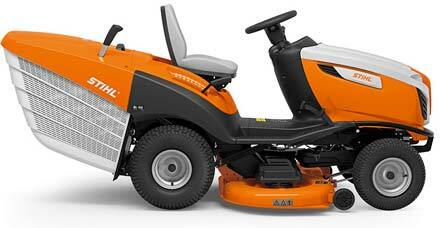 You can therefore control the speed of your STIHL ride-on mower automatically and continue working tirelessly. The LCD display clearly indicates all the important information, even in strong sunlight. The clippings are collected in the 350-litre capacity grass catcher box in the "dumper" design. Thanks to the flexibly adjustable level indicator you always know when it is time to empty the catcher box.